I finally got around to looking at the Marion County (Indianapolis) election results from November. I may write a few columns on the subject. Today's is about changing party fortunes in the nine Marion County townships. At the turn of the century, Republicans dominated the township boards in 8 of the 9 townships, i.e. 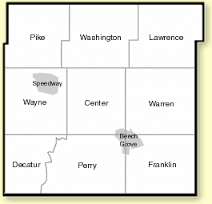 all the townships except Center Township. Now the story is that the Democrats dominate all the townships with the exception of the three southernmost, Decatur, Perry and Franklin. Circling-the-drain Marion County is a dead county girdled by the more vibrant, more youthful, and often more educated, urban and ex-urban counties. Those urban counties are where you will find more producers, more young families and more children (a/k/a "the future"), more growth, and relocated businesses offering meaningful employment featuring easy on-site parking. Crooked nitwits like the super-corrupt Republican ex-mayor Greg Ballard and his equally corrupt political enablers iced the graft cake with Vision Fleet, Blue Indy, a war-torn looking ROC with the David Brooks-crafted one sided contract inequitably favoring the ROC landlord over taxpayer interests, the widely derided east side expensive cricket stadium, (the idiotic) "Indy Eleven" Ozdimir franchise support, street clogging unused bicycle lanes... it just goes on and on. And the last time any sentient hard-working overtaxed Indianapolis resident or visitor looked it is all still there thanks to the world's most useless, most impotent, most unnecessary City County Councilors who, in essence, adorned the political graft cake with their own rosettes and sugar bells. Indianapolis, whose taxpayers have long been abused and shaken down by Republican and Democrat criminal political rackets working hand-in-hand (truth-be-told), has little going for it other than a poorly replicated [taxpayer funded] Disneyland-like downtown crammed with bars and beer halls, cheap commercial infills laced with sky-high cost rental apartments darkening once sunlit, once breezy open spaced streets formerly offering plentiful affordable parking, a dying Indy 500 (where the rapidly fading Brickyard races occur) whose upkeep was cleverly transferred from the super wealthy Hulman owners to.... wait for it... the taxpayers, and still the list enriching the political class and the special interests just goes on and on. Indianapolis suffers from ineffective, small potatoes career politicians skilled at picking meaningless political fights (roundabouts pole vault to mind). adept at pushing tax draining TIFs, and adrout at hawking fake "public-private" enterprises. Indianapolis taxpayers on to the corrupt political machines of the Democrats and Republicans and who lost their political voice to the special interests of the entrenched political class voted in the only way they could. With their feet. Protecting Marion County's economic interests is not a "meaningless political fight". The 7 roundabouts Carmel seeks to construct along E.96th Street will force several businesses and homes on the Marion County side of E.96th Street to relocate, and in all likelihood, outside of Marion County. The design of the roundabouts is such that little land is needed from the Carmel side of E.96th. It's Marion County, not Carmel businesses that will have to spend money to remodel their buildings to accommodate land needed for the roundabouts. The ROW and private land needed for the roundabouts wipes out all the parking spots of one business and 16+needed parking spaces for another. If we don't fight Carmel's seizure of Marion County land, we stand to lose more young families, more producers and businesses who will have re-located to the north side of E.96th Street.